Why the Name Redacacia for this Blog? If asked why the name redacacia for my blog, of course I will need to give some explanation. It is really filled with symbolism, as I am firm believer in sharing knowledge, that it doesn’t belong to me, its real owner being the humanity at large, regardless of whoever gets it. 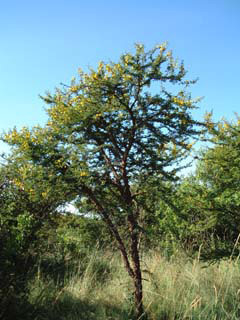 Red acacia (Acacia seyal; also known as Shittim wood or Shittim tree) is a thorny, 6-10 m (20-30 ft) high tree with a pale greenish or reddish bark. At the base of the 3-10 cm (1-4 in) feathery leaves there are two straight, light grey thorns. In var. fistula, whixh is more common on heavy clay soils, some of these thorns are swollen and house symbiotic ants. The blossoms are displayed round, bright yellow clusters approximately in 1.5 cm (0.5 in) diameter, growing to 7-20 cm (3-8 in) long. It is distributed from Egypt to Kenya and west Senegal. In the Sahara, it often grows in damp valleys. Ok so what’s special about it? It is the the most important supplier for gum arabic, a natural polysaccharide, that drips out of the cracks of the bark and solidifies. So it is so simple as that! 1 Response to Why the Name Redacacia for this Blog?